The i.HUG Foundation increases access to education for vulnerable children in Uganda to accelerate their path out of poverty. Working with partners, our programs empower them with the essential knowledge, services, and support needed to overcome extreme obstacles and realize their potential. The International HUG Foundation was established in 2006 and is a registered 501(c)3 organization. Education is a universal human right and a significant factor in the development of children, communities, and countries. In Uganda, more than half of all children live in absolute poverty and have little or no access to education. 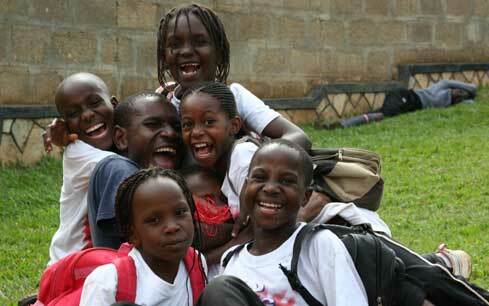 Uganda instituted Universal Primary Education in 1997 with the goal of providing an education to all children. However, today significant challenges still exist and too few children are able to go to school. For those who do enroll, less than 40 percent complete it. Only a quarter of Uganda’s children enroll in a secondary school. We exist to help accelerate access to education to help children go to and stay in school. Uganda is located in East Africa and is among the poorest countries in the world. It ranks 161 out of 187 countries on the UN’s Human Development Index. Half (51%) the population lives on less than a $1.25 a day, and 75% live on less than $2 a day. There are high prevalence rates of HIV/AIDS in Uganda resulting in more than 2 million HIV-related orphans in Uganda—the highest in the world. Our focus is on urban slums outside the capital city Kampala, which are underserved and for whom a significant number of children lack any opportunity to attend school. Slum life is difficult for children, who face pervasive violence of all kinds, familial instability, malnutrition, lack of access to health care and clean, safe drinking water. Watch this video about where we work. The i.HUG Foundation has made a significant impact on children’s lives. • More than 130 children have participated in i.HUG’s program and have attended school, received health care support and other basic necessities. None of these children had the opportunity to attend school without this support. • The provision of health care services and education has dramatically reduced several common childhood illnesses. i.HUG has reduced the incidence of malaria and fungal infections of its students by more than 90%. They have lower rates of malnutrition, malaria, fungal infections, worms, flu, and vitamin-deficiency problems compared with other children. • Our students also have better socio-emotional functioning. They suffer from lower rates of depression and higher child-competence scores when compared with other students surveyed at local schools. Parents and guardians are better informed on a variety of health issues and have greater child-health knowledge. • i.HUG sponsored children have a 1% drop out rate—markedly lower than other schools. Across the country, there is an average 57% drop-out rate.